Many people would sooner die than think; in fact, they often do so. Squirrels belong to a large family of small or medium-sized rodents called the Sciuridae, which includes tree squirrels, ground squirrels, chipmunks, marmots (including woodchucks), flying squirrels, and prairie dogs. Ground dwelling species are generally social animals, often living in well-developed colonies, while the tree-dwelling species are more solitary. Squirrels are indigenous to the Americas, Eurasia, and Africa and have been introduced to Australia (though - sadly, but understandably - not New Zealand). They are related to the dormouse. Squirrels have thumbs, a good sense of touch and an excellent sense of vision. The name "squirrel" comes from 2 Greek words that loosely mean "sits in the shadow of his tail". The grey squirrel, shown here, is one of the more robust members of the family. It can weigh up to a kilogram. The red squirrel or Eurasian red squirrel is common throughout Eurasia. It is arboreal and omnivorous and much smaller than the grey squirrel. Its underside is always white-cream in colour. The red squirrel sheds its coat twice a year, switching from a thinner summer coat to a thicker, darker winter coat with noticeably larger ear-tufts (a prominent distinguishing feature). The red squirrel can swim. Abert's squirrel (or tassel-eared squirrel) is a tree squirrel endemic to the Rocky Mountains from the US to Mexico, with concentrations found in Arizona, the Grand Canyon, New Mexico, and southwestern Colorado. Their most noticeable characteristic is ear tufts, which extend up from each ear 2 – 3 centimetres. They typically have a grey coat with white underbelly and a very noticeable rust-coloured stripe down their backs. They don't store food like other squirrels; they live in, and eat parts of, ponderosa pines. Flying squirrels don't actually fly, but rather glide between trees. They are nocturnal as this helps them avoid many birds of prey (though not owls). They eat whatever they can find and are particularly fond of truffles. The black squirrel is a melanistic subgroup of the eastern grey squirrel common in Midwestern North America, and parts of the Northeast. The black subgroup was dominant throughout North America before Europeans arrived in the 16th century, since their colour helped them hide in dense and shaded virgin forests. But hunting and deforestation led to biological advantages for grey squirrels. 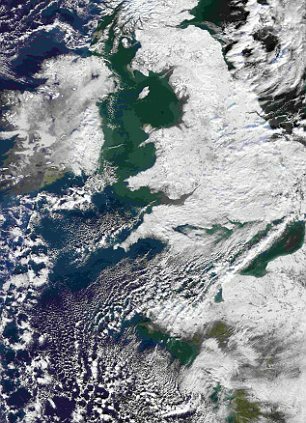 Today, blacks are abundant in the north, likely due to increased cold tolerance as they lose less heat than greys. Most white squirrels are albinos. Oddly, Olney, Illinois is known for its population of white squirrels. To maintain them, the city has passed ordinances preventing either dogs or cats from running loose; white squirrels have the right-of-way in all streets, and there is a $500 fine for running one over. In 1943 the their population reached its peak at 1,000, but now holds steady around 200. Illinois is the only state to have populations of both white and black squirrels. Once in a while, a black and a white squirrel meet and develop a relationship. And you know what happens then? Now, multiculturalism appears to be the new trend. These squirrels are called piebalds (white plus other colours). 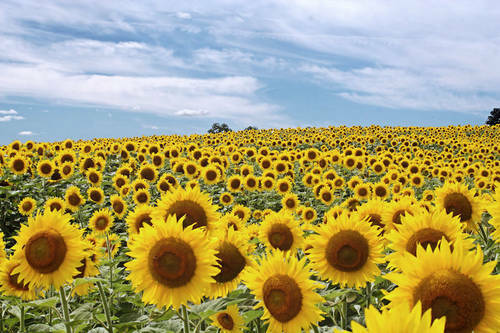 Also by the photographer (named Alfresco) who took the squirrel photo on the right above is this incredibly upbeat photo of a field of sunflowers (the photographer estimates there were more than 5 million) at the Abbey of the Genesee in Piffard, New York. I would think this would be a rodent's idea of heaven. The best-known study demonstrating inattentional blindness asked subjects to watch a short video in which two groups of people (wearing black and white t-shirts) pass a basketball around. The subjects were told to either count the number of passes made by one of the teams or to keep count of bounce passes versus aerial passes. In different versions of the video a man walks through the scene carrying an umbrella, or wearing a full gorilla suit. After watching the video, subjects are asked if they saw anything out of the ordinary take place. In most groups, 50% did not report seeing the gorilla or umbrella. Why not? People are mistaken in thinking that an important event will automatically draw their attention away from their current task or goal. 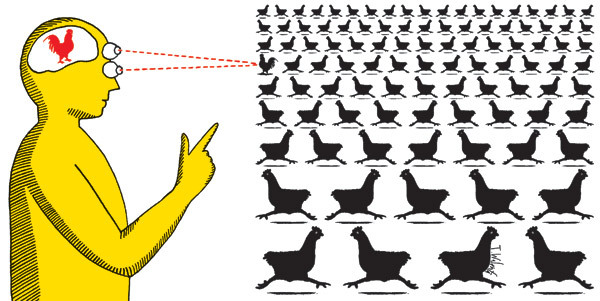 The relationship between what's in one's visual field and what's perceived is based much more significantly on attention focus than had previously been thought. Consequently, a public safety advertisement was designed to point out to cyclists the potential dangers caused by inattentional blindness in motorists. A related field is called change blindness, a phenomenon that occurs when a person apparently fails to detect large changes in the visual scene they're observing. For change blindness to occur, the change in the scene typically coincides with some visual disruption such as a saccade (an eye movement) or a brief obscuration of the observed scene or image. Change detection is also poor when a change is introduced during a cut or pan in a motion picture, even when the change is to the central actor in a scene. People also regularly fail to notice editing errors in commercial movies despite the intense scrutiny during the production process. Change blindness can be particularly dramatic when changes occur unexpectedly - with many observers even failing to notice when a person they were talking to was surreptitiously replaced by a different actor. Change blindness has now been shown to occur with a wide variety of visual disruptions such as blinks or transient noise flashed on a display. When observers are asked to selectively pay attention to a target at the centre of their visual field while ignoring surrounding "distractor" objects, the prior induction of a positive emotional state leads to more interference from the surrounding objects than does induction of a negative mood. Positive moods are associated with a tendency to perceive global components and negative moods with a tendency to perceive local components of a given visuospatial stimulus. An example of this is the so-called "weapon effect" - those who witness a crime involving a weapon normally have impaired memory for the appearance of the perpetrator because their attention shifts to the weapon. The negative emotional content of the event enhances the visual processes by which a specific detail (the weapon) is perceived and later remembered. This occurs at the expense of irrelevant peripheral information, which is suppressed, or filtered out. Such mechanisms serve to increase one's vigilance in a possibly life-threatening situation. Positive emotions enhance one's awareness and this global perspective encourages novel thoughts and actions, leading to increased creativity and inventiveness. 10 volunteers were put through days of memory tests in a studio and assumed this was the research. In fact, two intricately planned and elaborate mock crimes - a fatal stabbing and an armed robbery - were really what mattered. On one day the participants went for lunch to a local pub, which was really filled with actors, stuntmen and 10 hidden cameras. A fight broke out and someone appeared to be stabbed and killed. The whole scenario unfolded over 20 minutes. Detectives treated each mock crime as if it were real, interviewing the volunteers, but unlike a real case, the force's conclusions about what had happened could be checked against what exactly went on. It was a real test of memory skill. During each of the dramas the eye trackers - used in the so-called "tests" and still being worn by some volunteers during the mock crimes - were able to pinpoint exactly what people were looking at and compared that to what they reported they had seen. The differences, say those involved, were in some cases staggering. Women who went to university consume more alcohol than their less-educated counterparts, a major comprehensive study has found. The findings come from the London School of Economics, where researchers tracked the lives of thousands of 39-year-old women and men, all born in the UK during the same week in 1970. The report concludes: "The more educated women are, the more likely they are to drink alcohol on most days and to report having problems due to their drinking patterns. The better-educated appear to engage the most in problematic patterns of alcohol consumption. Women's alcohol consumption can even be predicted from their scores in school tests taken when they are as young as 5 - women who achieved 'medium' or 'high' test marks as schoolgirls are up to 2.1 times more likely to drink daily as adults." Do you smile because you're happy, or are you happy because you are smiling? Botox, which is used by millions of people every year to reduce wrinkles and frown lines on the forehead, works by paralysing muscles involved in producing facial expressions. A recent study suggests that by doing so, it impairs the ability to process the emotional content of language, and by paralysing facial muscles, may actually diminish the experience of emotion in those who use it. (Some actors are suspected of using botox because their faces have become less expressive as they age.) Some 4.6 million people received botox injections in 2008 in the US alone, making it by far the most popular cosmetic procedure. The Great Conveyor Belt is a massive circulating current of fire (hot plasma) within the sun. It has two branches, north and south, each taking about 40 years to perform one complete circuit. Researchers believe the turning of the belt controls the sunspot cycle, and that's why the slowdown is important. "Normally, the conveyor belt moves about 1 metre per second-walking pace," says Hathaway. "That's how it has been since the late 19th century." In recent years, however, the belt has decelerated to 0.75 m/s in the north and 0.35 m/s in the south. "We've never seen speeds so low. The slowdown we see now means that Solar Cycle 25, peaking around the year 2022, could be one of the weakest in centuries." Sunspots are magnetic knots that bubble up from the base of the conveyor belt, eventually popping through the surface of the sun. Astronomers have long known that sunspots have a tendency to drift-from mid solar latitudes toward the sun's equator. According to current thinking, this drift is caused by the motion of the conveyor belt. "By measuring the drift of sunspot groups," says Hathaway, "we indirectly measure the speed of the belt." Their dead jaws are clamped into the vein of a leaf. They are very close to the ground (but not on the ground). They are located on the north northwest side of the tree. It’s so precise, you almost can’t help but imagine the inside of the head of an ant, with a fungus sitting behind a steering wheel. One key point is that the fungus can’t start reproducing until some days or weeks after the ant has died. What chemicals are the fungus releasing into the ant’s brain that lead the ant to such specific locations, and cause it to perform such exacting behaviours? 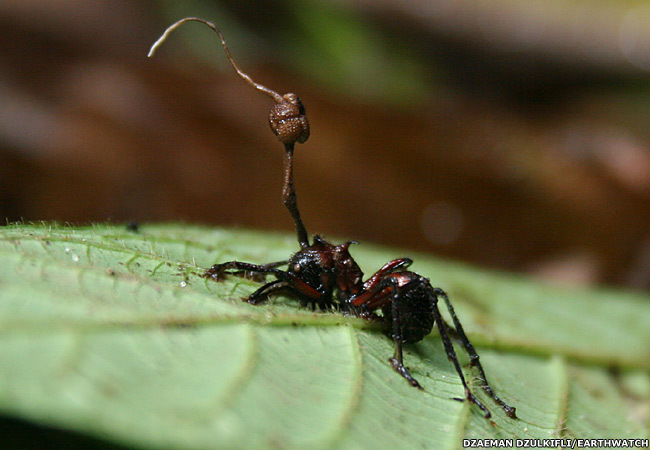 There are a few other ant species that the fungus can infect but rarely does. 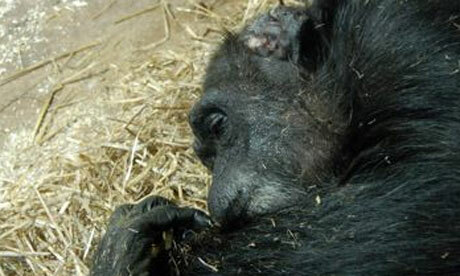 When those animals are infected, their corpses are found significantly higher in the trees than the preferred species. This hints that the fungus can’t control this ant species so well as the one it usually infects. About 800 people are thought to be struck by lightning annually and live to tell about it. Steve Marshburn was at his bank job taking a business deposit when lightning struck. He wrote: "A bolt of lightning struck our drive-through window's speaker, which was not grounded. The bolt entered the bank [that way] and hit my back, breaking it, with the most unbearable pain ever experienced. It threw me on the window. I could not speak. No one came to my aid. At the time, folks thought if you touched anyone that had been struck by lightning you would be injured [a myth]. My back felt as if it had been slashed with a machete. My spine, from tailbone to head, was in trouble. I was holding a metal teller stamp ready to stamp the deposit ticket. The bolt crossed my heart. I knew the wiring in my body was affected." Jerry LeDoux of Sulphur, Louisiana survived multiple lightning strikes, 1st in August 1999 and again in August 2005. Michael Utley, struck on a golf course in May 2000, says: "I can't pop light bulbs, don't tell the future, can't stop watches. None of that neat stuff. Ten years later, I still fall down when I walk. I'm emotional and irritable. Traumatic brain injury doesn't go away. You're walking around, you look normal but you don't work right. You don't work the same way." Keraunomedicine is the medical study of lightning casualties. The pattern left on the skin after a strike is called (among other things) a lightning flower. Let's assume the ad is legit, in the sense that this product was actually for sale a century ago. Did whatever they were selling really contain live tapeworms (or tapeworm cysts or eggs or heads)? 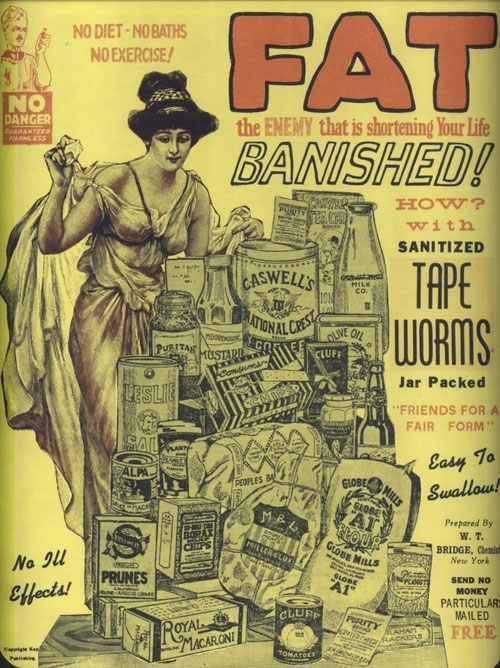 Fact is, having a tapeworm inside you is beyond gross. An adult tapeworm can grow up to 50 feet long and live up to 20 years. Tapeworm eggs are even worse, as the larvae that emerge from them are prone to burrow out of your intestines and find homes elsewhere in your body. For example, the pork tapeworm can cause neurocysticercosis, in which the larvae migrate through the stomach or intestinal lining and up into your brain. There they form destructive cysts, triggering immune responses that can lead to epileptic seizures or worse. The cysts formed by sheep tapeworm larvae may reach the size of grapefruit; they can rupture blood vessels when they break, resulting in shock and death. But will I lose weight? Probably, but there are some real downsides to tangling with even the relatively benign beef tapeworm, including nausea, abdominal pain, diarrhœa, and a general feeling of illness. There's also the risk of malnutrition. The fish tapeworm, for instance, can steal vitamin B-12 from its host, leading to anæmia. If you ask me, the possibility of having a worm emerge unexpectedly from a bodily orifice is also a significant disincentive. Plus you might get ascites, a fluid build-up causing your gut to swell, which is hardly the desired effect. But come on, if people will try stomach stapling, they'll try anything. In 1945, Walt Disney signed Aldous Huxley to write a screenplay for Alice and the Mysterious Mr Carroll, a combination live-action and animated incorporation of Alice’s Adventures in Wonderland with the biography of Lewis Carroll (Charles Dodgson). Dodgson, a beleaguered Oxford lecturer known as the Dodo, has already written Alice in Wonderland under the name Lewis Carroll. He and Alice take refuge in Wonderland from Alice’s cruel governess and Dodgson’s Tory vice-chancellor. These villains, who disapprove of "nonsense books", must never learn that Dodgson and Carroll are the same person, lest Dodgson be barred from a coveted university librarianship. A series of fantastic adventures culminates with the resolution of the Carroll-Dodgson identity through a deus-ex-machina appearance by Queen Victoria. "It was so literary I could understand only every third word," Disney said of Huxley’s script, which he didn’t end up using for his adaptation of Alice in Wonderland (1951). As complex as the chemistry of life may be, conditions for vigorous growth of plants boil down to 3 ingredients: nitrogen (N), phosphorus (P) and potassium (K), whose percentages are prominently displayed on every package of fertiliser. In the 20th century these nutrients enabled agriculture to increase productivity and the world’s population grew more than 6-fold. We obtain N from air, but must mine P and K. The world has enough K to last several centuries - but P is a different story. Readily available global supplies may start running out by the end of this century. By then our population may have reached a peak - some say beyond what the planet can sustainably feed. Moreover, trouble may surface much sooner. As oil price swings have shown, markets tighten long before a given resource is anywhere near its end. And reserves of P are less evenly distributed than oil, raising additional supply concerns. The US is the world’s 2nd-largest producer of P (after China), at 19% of the total, but 65% of that comes from a single source: pit mines near Tampa, Florida, which may last only a few decades. The quest for fertiliser was behind an American land grab beginning 150 years ago, when the Guano Islands Act of 1856 empowered US sailors to seize islands around the world for their deposits of nitrogen-rich bird and bat guano. One excellent source of P, it so happens, is urine. To harvest this resource, Sweden rolled out special urine-diverting toilets, which use partitioned bowls to send urine to storage tanks for P recovery. Will American homes ever store urine? Who knows? Meanwhile nearly 40% of global reserves are controlled by a single country, Morocco, sometimes referred to as the Saudi Arabia of Phosphorus. Although Morocco is stable and friendly, the imbalance makes P a geostrategic ticking time bomb. Free: 1 can of pork & beans with purchase of a 3 bedroom / 2 bath home. Tickle Me Elmo. Still in box. Comes with its own 1988 Mustang 5-litre automobile, excellent condition - $6,800. Buy: "I love you only" Valentine cards, now available in multi-packs. Human skull, used once only. Not plastic. $200. Tired of cleaning yourself? Let us do it. Tired of working for only $10.75 per hour? We offer profit sharing and flexible hours. Starting pay: $8 - $10 per hour. We will oil your sewing machine and adjust tension in your home. Dinner Special — turkey $2.35, chicken or beef $2.25. Children $2.00. Free: farm kittens. Ready to eat. Professional electric meat grinder, large. Also box of puppies. Call after 6pm. Found: dirty white dog, looks like a rat (been out a while). Better be reward. Free Yorkshire terrier, 8 years old. Hateful little dog. Bites. For sale: quilted high chair that can be made into a table, potty chair, rocking horse, refrigerator, spring coat, size 8 and fur collar. No matter what your topcoat is made of, this miracle spray will make it really repellent. Largest selection ever: "If it's in stock, we have it!" An archæological find of a 1,000-year-old Viking belt buckle from Kungsbacka close to Gothenburg, Sweden was used to evaluate a method of duplicating archæological artefacts by creating 3D copies as accurately as possible - even with regard to surface colour and texture. The buckle was placed on a surface with optical markers which were used by the portable 3D scanner for real-time self-positioning. Scanning took about 15 minutes. The 3D model was then exported to UV-texturing software, then sent on to the 3D printer. During printing, the model is built up layer by layer on a bed of white plaster powder using coloured binders. Printing takes about half an hour. The machine automatically recycles unused powder for later use. Several items can be "printed" at once. Finally, the 3D printed model is dipped into a hardening substance to give it strength and final surface finish. It can then be waxed and/or varnished if desired. The original model is on the left and the 3D print on the right. More. The power of the quake lifting a layer of dust off a mountain range. Via Neatorama. Volcanic ash is seen over Iceland's main ring road south of the eruption in April. Pileus ("mushroom cap") cloud by David LaPuma. During the day warm moist air in a cumulus rises and the cloud towers upward. Sometimes the vertical growth pushes a layer of moist air above. This air layer expands as it's forced up into lower pressure surroundings and adiabatically cools. The water vapour suddenly condenses, forming a misty veil-like layer of droplets above the cumulus. Any cloud formed suddenly will have droplets of similar size - ideal for iridescence or corona. The tattoo at left is one of the "Top Nine Most Unusual Tattoos in Existence". I didn't agree with the other 8 (I find most tattoos rather silly), but I found this glow-in-the-dark tattoo to be impressive. The 9 included a version of the tattoo at right, but I didn't like it nearly as well as I did this one - dunno exactly why. In the final hour, they huddled around, studied her face and shook her gently as if to revive her. And when the others had drifted away, one stayed behind to hold her hand. As death scenes go, it has all the poignancy of human loss, but this was no everyday tragedy. The last breath was drawn before scientists' cameras and represents one of the most extraordinary displays of chimpanzee behaviour ever recorded. A bobcat licks its paws after climbing a saguaro twice in order to flee another bobcat on a ridge in Tucson, Arizona. Photo by Jill Torrance, Arizona Daily Star. The Support Department, however, had a rather dismal season, as they won only one game all year. Boredom is... a vital problem for the moralist, since half the sins of mankind are caused by the fear of it.